Graz, in southeastern Austria, is the country’s second-largest city, playing host to 300,000 residents, 40,000 students, and an increasing number of local and international tourists. It has been designated a UNESCO City of Design, and its historic city center, which contains architectural wonders that span epochs, is a UNESCO World Heritage Site. The streets and sidewalks are always bustling with sightseers, commuters, restaurant-goers, shoppers, and leisure seekers. With lots of foot, bike, and motor vehicle traffic, Graz needed to ensure that pedestrians with visual impairments could navigate the city with ease. So a group in the Department of Geography and Regional Science at the University of Graz—which, in addition to being an educational institution, researches and advocates for urban sustainability—set out to design an app that could help with this. It ended up with ways2see, a pretrip planning GIS web app with an app-to-screen reader for the visually impaired—all built with Web AppBuilder for ArcGIS. Although Graz is a modern city and is even seen by some as an up-and-coming tech and startup hub, the city had not really laid the groundwork to build such an app. For example, there was no geospatial dataset for the sidewalks that accompany Graz’s 1,100 miles of streets. As a result, the team had to collect a considerable amount of data before it could even start developing a solution. To kick off the project, the team at the University of Graz—four graduate students led by associate professor Dr. Susanne Zimmermann-Janschitz and supported by research associate Sebastian Drexel—partnered with Esri’s official distributor in Austria, SynerGIS Informationssysteme GmbH. It secured funding from the Austrian Research Promotion Agency (FFG) and recruited the Odilien Institute Graz, which trains and cares for people with visual impairments or blindness, to carry out end-user needs assessments on the app. With all the logistics worked out, the team from the Department of Geography and Regional Science first conducted interviews, workshops, and surveys with partially sighted or blind people in Graz and around Austria, as well as mobility trainers. Based on the results, the team determined that the sidewalks dataset would need to identify navigational aids that those with visual impairments typically use as guides, such as walls or fences. It would also have to include lampposts, mailboxes, and the like, which can serve as both landmarks for and impairments to navigation. Additionally, the app would need to let users know where crosswalks are located and notify them of challenges along the route, such as intersections, narrow passageways, and bicycle traffic. After determining the specific needs of users with visual impairments or blindness, the university project team began to catalog the required geospatial data. The team generated sidewalks using open government data from sources including post offices, the chamber of commerce, the local medical association, the City of Graz, and OpenStreetMap. Team members then enhanced what the government had by including additional sidewalk information—such as availability and surface conditions—they collected and mapped out in the field using Collector for ArcGIS. With the details included in its sidewalk dataset—such as where there are fences, mailboxes, and crosswalks—the app can take different user types into consideration. For example, some people who are partially sighted or blind prefer to find their way using acoustics or tactile guides, and some try to bypass intersections whenever possible. Once all the sidewalk data was recorded and uploaded to ArcGIS Desktop and ArcGIS Server, the team evaluated which technology it would use to build the app. Because developing ways2see was already going to involve a great deal of customization to make it work with keyboard-only navigation and screen readers (which convey via speech what’s displayed on a screen), nobody wanted to have to build the app from scratch. So the team selected Web AppBuilder for ArcGIS as its development tool. Web AppBuilder for ArcGIS comes with workflows and widgets that can be customized and extended as needed. It also offers built-in support for developing for multiple operating systems and devices. All this would make it easier to optimize the ways2see user experience so it could accommodate a wide range of users—from people who prefer to find their way using acoustics or tactile guides to those who try to bypass intersections whenever possible. “The overall idea behind ways2see is to create a GIS for all people, whether or not they [have] disabilities,” said Zimmermann-Janschitz. And that is what the entire team did, engaging in an intensive back-and-forth process of development and testing. Zimmermann-Janschitz, Drexel, and the graduate students made it so that ArcGIS Network Analyst could read features, other than street names, that are located along lines, such as where the curb is or if there is a hedge or a house. SynerGIS generated a framework, as well as widgets, that could be navigated via keyboard and are accessible to screen readers. And members of the Odilien Institute, along with several mobility and orientation trainers, have comprehensively tested the app to improve the product step-by-step. The ways2see app is now available, and users are starting to employ it to preplan trips around Graz. Early feedback has generally been very positive and is helping the development team identify missing functionalities, fix problems, and improve the app for different operating systems. 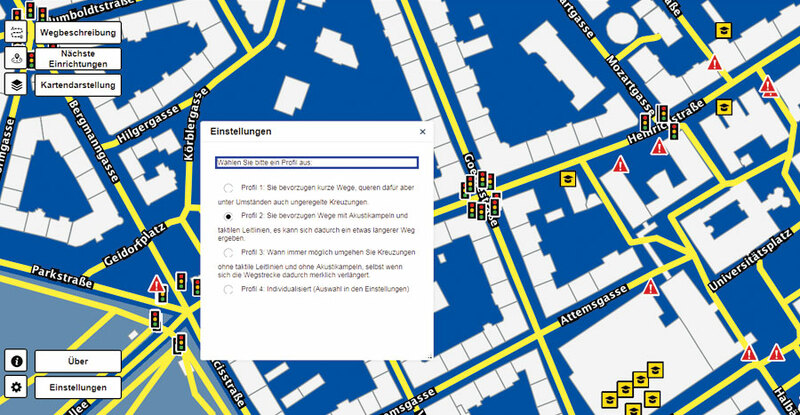 Using the ArcGIS platform—and, specifically, Web AppBuilder for ArcGIS—it took the University of Graz team, along with its partners, three years to collect and record all the sidewalk data it needed and develop a workable app that can help people with visual impairments or blindness navigate a busy city. It is a framework that can be easily adopted by other cities using their own local datasets. “If you want to do something for people with disabilities, success is defined…not in terms of money or business, but by helping [people] gain more independence and individuality through inclusion,” said Zimmermann-Janschitz. With a functioning version of ways2see and plenty of positive feedback on how it works, it appears that this team is driving toward just that kind of success.